Leeuwenburgh is a name in veneer. Leeuwenburgh Veneer has been active in the supply and processing of high-quality veneers for more than 30 years. With craftsmanship and passion, we work on a wide range of decorative products. 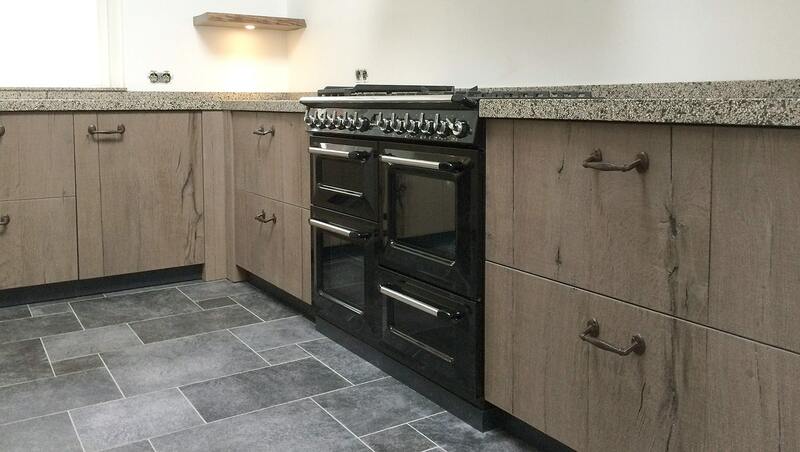 Our dedicated team of veneer specialists work hard every day to find solutions to traditional wood veneering problems, making it easy to specify, order & use whatever the project – interior design, yacht interiors and kitchen construction. We are happy to work with you on your particular wood veneer project. View the possibilities and be amazed about the many veneer applications! Wood veneer is a natural product made from trees. No tree is the same, so that every strip of veneer has its own character and drawing and thus a natural look. Because wood does not shrink or expand equally in every direction, solid wood will soon have a tendency to ‘work’. Especially with very rustic wood this can lead to problems. Veneer is glued on a stable support which virtually excludes work. Our flexible wood veneer sheets are easy to process into all kinds of shapes. It enables applications that can not be realised with traditional processed veneer. The different Ligna products can be fine-tuned to each other so that they can be processed in combination. 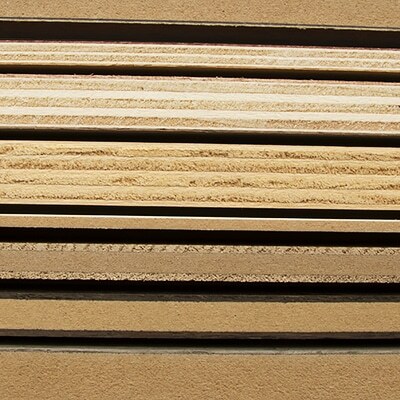 Leeuwenburgh Veneer can supply finished wood veneer to different processors for the same project. No more deviations when the job is finished. The production of veneer is an intensive and meticulous process that requires a lot of craftsmanship. There are various possibilities for processing a round log into veneer. In practice, it usually comes down to peeling or slicing systems. Originally, the log was sawn into thin strips, but nowadays the veneer is almost always sliced or peeled. A distinction can also be made between the peeling veneer used for the construction of plywood, for example, of which the grain is unimportant, and the noble veneer in which the sequenced pattern is very important. There are different ways to join strips together, the joining method is decisive for the appearance of the veneer. The standard method of joining has been book-matched, with each strip of veneer being the mirror image of the previous strip. Other options are slip-match, ‘mixmatch’ a random pattern and slip-swing a rotated repetitive pattern. 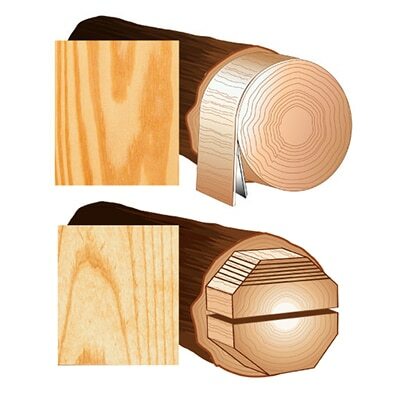 The jointed veneer can then be pressed under high pressure and temperature onto paper-coated or resin-impregnated papers, the latter being hardened to form a laminate backer. 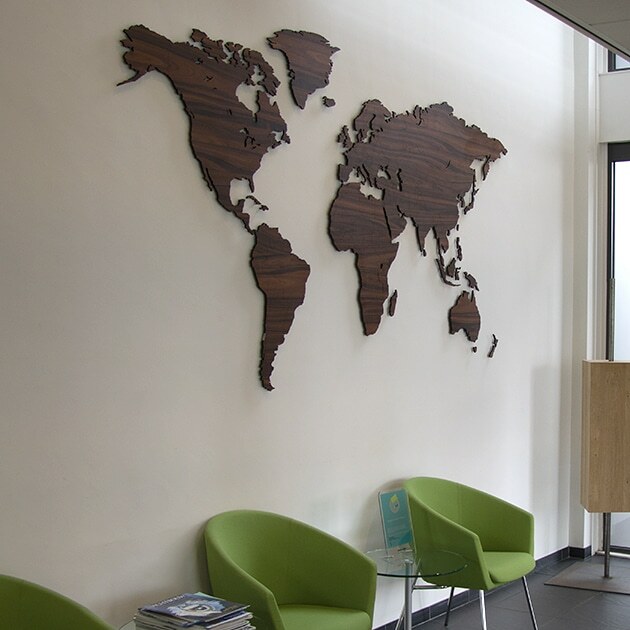 The joined veneer can also be glued to various substrates such as MDF, plywood or chipboard. 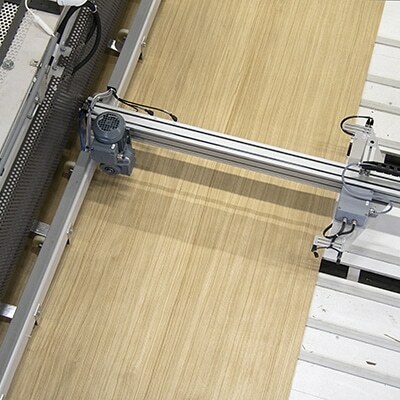 The sheets and wood laminates can then be finished on different lacquering lines. Through experience and know-how Leeuwenburgh Veneer is able to deliver consistent products. Efficient but without concessions. 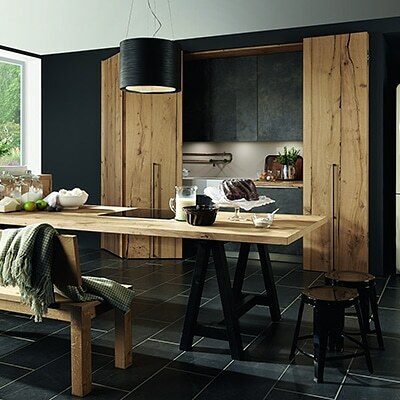 A finish with liquid paint that follows the structure of the wood. Wood must remain wood!